USF Trustees meet Tuesday while a crowd looks on at the USF Gibbons Alumni Center. WUSF's Mark Schreiner reports on the agreement between USF and its graduate assistants. The special meeting of the University of South Florida Board of Trustees Tuesday only covered two topics, but ended up running as long as some regular meetings due to the importance of both subjects. First, the board approved a contract with the more than 2,220 graduate assistants who teach classes and conduct research - a deal almost a year in the making. Then, they approved an increase in rates for USF residence halls. Members of the USF chapter of Graduate Assistants United (GAU) overwhelmingly approved their agreement with the school in late April, and trustees followed suit, passing the deal unanimously. The contract gives doctoral level students a 13% pay bump to a minimum stipend of $12,600, while masters level students will get a 6.7% increase to a minimum of $10,540. They'll also receive a one time cash bonus of up to five hundred dollars. The university will also continue to pay for graduate assistants' health insurance, with a new premium set at $2,410 plus one percent above the consumer price index. Doctor Kofi Glover, who serves on the university bargaining team, told trustees that the agreement met the school's expectations. "The whole package comes out to about $627,939, which is really two percent of the base salary for graduate assistants," Glover said. "That is what President (Judy Genshaft) promised, so we have fulfilled that goal." That breaks down to $404,102 more in minimum stipends and $223,837 more in insurance premiums. Graduate Assistants United USF Chapter President Megan Flocken (center) speaks to USF negotiator John Dickinson (right, with back to camera) in March. USF GAU President Megan Flocken said she's happy with these improvements, but concerns remain over a number of unresolved issues. "Strengthen tuition waivers, some kind of address and relief for the fees that graduate assistants pay - sometimes 12 to 15% of their income go back to the university in the form of fees, also a strengthened system of dates and notifications for summer appointments," Flocken said. As a matter of fact, Flocken said, a number of grad assistants still have yet to hear if they'll be teaching classes during the summer session, which starts May 16. In addition, Flocken didn't like that it took almost a full year of negotiations to reach an agreement. "I have to say honestly that we were a little disappointed that it took as long as it did to reach an agreement, leaving a lot of our livelihoods in the balance for so long," Flocken said. But ultimately, I think that the GAU is proud of the contract that we were able to negotiate." That pride has a limited tenure - both sides will be back at the negotiation table on next year's deal in just a few weeks. The trustees' discussion of a second issue - increased rent for on-campus residents - took up the remaining ninety minutes of the two hour meeting. USF had raised rates only once since 2012, compared to some other Florida public universities that have raised them annually. As a result, USF's rates were at the middle or bottom of the average cost, depending on the size of the room - double occupancy suite, traditional double room or single room in a four-bedroom apartment. Among the reasons given for the rate hike were higher administrative costs, a temporary decrease in the number of beds during destruction of the existing Andros Housing Complex and construction of a new housing village, and a need to meet terms from the University's lenders. Some students had complained that rates across the system didn't change equally, with monthly rents going up anywhere between $20 and 120 dollars depending on the accommodation. Housing and Residential Education Vice President Ana Hernandez defended that as a strategic decision. "We wanted to make sure that we had some rates that still maintained a balance of affordability with having 2,100 spaces that were going to be under $3,000," Hernandez said. "We also looked at what the demand is on campus, as well as the different amenities and age of the buildings that are offered." Hernandez added that USF recently dropped its requirement for all first-year students to live on the Tampa campus unless they lived at home within a three county area. "So this is the first summer and fall class that are no longer required to live on campus, though we still are experiencing very high demand and we have the opportunity to accommodate more transfer students, which we haven't been able to do in the past," Hernandez said. Students who aren't sure if they want to live on campus have a few more days to make up their minds, as the board voted to extend the deadline to cancel reservations without a penalty to next Monday. The Andros student housing complex on USF's Tampa campus is slated to be replaced with a private-public financed student housing village. Extended University Beat report on negotiations between USF and the school's chapter of Graduate Assistants United. While the University of South Florida's Tampa campus has 1,700 faculty and 1,800 staff members, the largest part of the workforce is the school's 2,300 graduate assistants. 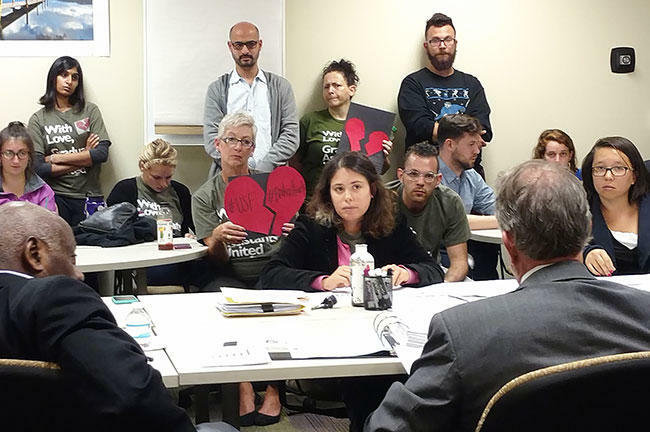 During contract negotiations that have lasted for almost a year, the union representing that group is pushing USF for a pay raise and continuing full healthcare coverage. USF Pursues 'Path To Preminence' - What Does That Mean? On Monday, University of South Florida President Judy Genshaft sent a letter to faculty and staff announcing a new direction - a "path to preeminence" - that aims at bringing the school into "the ranks of America's most elite universities in the next few years." It's more than just a phrase. Schools in the State University System that achieve "preeminence" or "emerging preeminence" get additional funding from the Florida Legislature. But what do these statuses actually mean? The University of South Florida is a step closer to tearing down a fifty-year-old student housing complex on its Tampa campus and replacing it with a 'village' that would be home to 2,165 students. At USF Board meeting in St. Petersburg Thursday, trustees approved a public-private partnership agreement, also known as a 3P, with Capstone Development Partners and Harrison Street Real Estate Capital to build the estimated $133 million complex. As part of the launch of the new half hour weekly program, University Beat on WUSF TV, University of South Florida System President Judy Genshaft sat down to talk with show host, veteran Tampa Bay journalist Denise White.